Is this the Sony Xperia Honami Mini? There have been a bunch of Mini phones on the market lately (HTC One Mini, Motorola Droid Mini and Samsung Galaxy S4 Mini anyone?) plus rumors of Sony making its own Mini to join the fray. 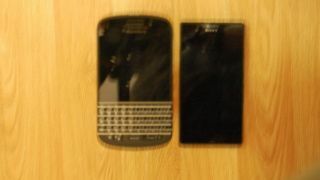 The supposed Sony Xperia Honami Mini has shown up in another leak, this time in a blurry comparison shot next to a BlackBerry device. The source claimed the Honami Mini is packing a Snapdragon 800, the same processor that might be in the new Sony Xperia i1 (or Honami or Z1). This may be a bit of a stretch since the Mini is rumored to have a 4.3-inch 720p display. However, the leak also said the Mini will come with 2GB of RAM and a 20.7MP camera sensor with 1/2.3 F 2.0 Sony G lens. Inside you'll find 16GB of storage space and a battery sitting at 2400 mAh, which matches earlier leaked reports. The Honami Mini isn't the only thing tantalizing Sony Xperia fans. Just like last week's social media tease, Sony took to Twitter and Facebook again to post another #bestofsony glimpse of its expected flagship, the many monikered Sony Xperia i1. And instead of the minimal power button Sony has shown us a bit of the camera (or more specifically, a G lens) - a feature from Sony's line of lenses for DSLRs and digicams. This confirms earlier reports of the lens which means rumors of a 20.65MP camera with a resolution of 3936 x 5248 on the Xperia i1 may prove to be true. We'll find out soon what the camera can do if Sony actually showcases the new Xperia device at a possible IFA reveal on Sept. 4. Update: Hold onto your hats, because this Honami train just keeps on rolling. A series of illicit images supposedly from a hands on session with the Honami (the larger version, not the Mini) made it online today. The original pics appear to have been sent to 404 limbo, but we have a few courtesy of Digi-Wo (via SlashGear). There's not a ton to glean from the snaps, though the device looks rather thick. It appears to have plenty in common with the Xperia Z, though a user noted it's heavier than that device and its screen is more "white" as colors are less saturated.The effect is reportedly due to the phone's use of X-Reality tech versus Sony's Bravia Engine 2. Is the hyped up Moto X any good? Find out what TechRadar thinks.